Until I find my charger--here's a picture of my two favorite pairs of shoes... 12 bucks at Kmart! 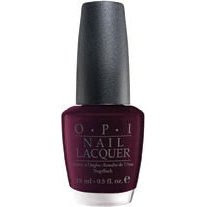 And, the two new OPI shades that I must have! Dark nailpolish are very trendy this winter ! But not just black there are lots of colours like dark blue or violet. Don't hesistate !